We're still waiting for the call, shocking, I know... I would be lying if I said I was not getting antsy or annoyed. Anyone in this situation I'm sure has had similar feelings. It's hard not to think about it. I mean it's not like we're home in Colorado, where we might be able to forget for a little what we're waiting for. Unfortunately for us, we have a constant reminder of what we're in Minnesota for. Every morning I wake up to the sound of my alarm clock to administer Rima's morning IVs. Each morning disappointment hits, the call did not come. Every time Rima's phone rings I look over to see if it's a 612 area code, which will be the area code when the call comes. Every night before I go to bed all I can think about is the call. I send out good vibes to the universe. I visualize us driving to the hospital, Rima in the pre-op room, Rima in the ICU after her transplant. I visualize this multiple times a day. I'm a believer in putting out positive vibes into the universe and that if you believe in something hard enough it will happen for you eventually. In some capacity, from constantly thinking and visualizing or your actions. I'm definitely loosing that perspective and belief. Me thinking or visualizing the transplant, is not going to make it happen any faster, all it's going to do is make me more anxious and upset that it has not happened yet. I'm also a huge control person. I find nothing wrong with being a control person. I think more people should be like this, more good things would get done and faster. My career has been made up of always having to solve problems and come up with solutions. There's always a solution, think outside the box, you can always do something. There is nothing I can do in this situation to speed things up for us. This whole thing is completely out of my hands. I've really had to learn what patience is. Patience is ignoring reality and creating an alternate world where Rima and I are here because this is where we decided to live. Hahah, yes I know funny, but it's better than thinking about how isolated we are from almost everyone we know. Don't get me wrong, I'm super grateful that Rima has such an amazing team behind her back. That we have a transplant team that actually likes us and is rooting for her. I'm grateful for the house we are renting from an amazing CF organization. I'm super grateful for all this solid quality time I get to spend with Rima. Like I've said before we have it a lot better off than most people. We are making the best out of this adventure and exploring a new state we would never have if it were not for her transplant. But, and there is always a but, we are living in limbo, we can't go back to Colorado and we can't really plan too far ahead. We're at the mercy of a match, of someone else's loss and pain. It's been really hard not to think about that if Rima's dry run on Halloween would have been the real deal, and if all were going well, we would be going back to Colorado at the start of March. Multiple people on her transplant team keep telling us she's at the top of the list and that the call could come at any time. They have been telling us this since October. You would think having all these people telling us this stuff would be good, but in reality it makes it worse. Knowing that for the last three to four months she's been high up on the list and people have been expecting the call to have already happened makes us think it's not going to happen for us for a while. I'd rather not have things like that told to us. It makes waking up in the mornings to the realization no called occurred ever harder. A few developments have happened since our last post. Rima had a clinic appointment this past Tuesday, a week after her first one. The first one after being discharged did not go very well. I'm very happy to say that this past one was almost a 180. Her PFTs were at 17% FEV1, she did blow a 19% once but the other three were 17%. Her weight went up again!! She is now 133lbs!!! This is incredible news! I'm so impressed with her, she reached her goal of 130 and kept climbing higher! Her pulmonologist did not try to talk us into having Rima go back into the hospital, instead she said she would not have to see us for two weeks! Rima has been having issues with her port, at times it's been hard to flush it. She got an X-ray to see if the line had moved somewhere where it shouldn't be, but the x-ray looked fine. Her team said they wanted her to go to IR (interventional radiology) to get it checked out to see if there was a fibrin build up occurring in the line or at the end. We have an appointment with IR next Tuesday. We are not thrilled that it's interrupting our Valentines day! Last Friday we had a girl's night out. The funny part about that statement is that it's girl's day in or night out with us all the time since it's just the two of us. We went to the winter carnival in Saint Paul. Some of the medical staff had told us about this and suggested checking it out. 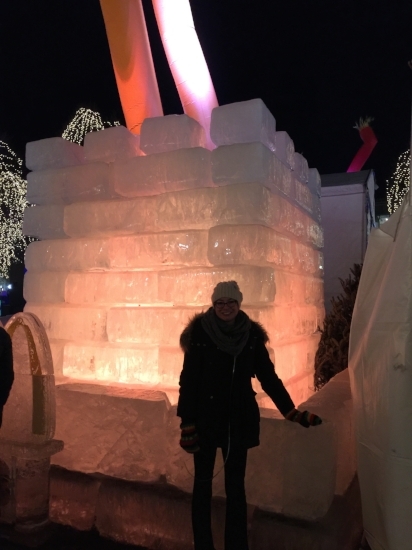 They have a bunch of ice sculptures on display, live music, some booths, and ice towers. We walked around for a little in the freezing cold and got some pictures. Rima was all about the Ice. She also was all about the wacky waving inflatable tube men. After the carnival, we went to get a cocktail at a speakeasy in Minneapolis. A little treat never hurt anyone. On Monday Rima had pulmonary rehab and then that night we had a little dinner party. My friend Kim and our new friend Tessie came over for dinner. Tessie is a masseuse and had given Rima a massage at the hospital once before. Lucky enough a second massage was on the agenda for Rima that night. After Rima's relaxing massage we had dinner. Asian themed night! Who doesn't love a good spring roll and some noodles? The big adventure for us was Thursday night. We drove to Stillwater, which is about 45 minutes east to go visit the Ice Castles. We have never been to anything like this before. It was pretty incredible. A pretty large area next to the Saint Croix River had been transformed into a magical ice land. I felt as if we were in Antarctica at times. All they need is some penguins running around. We timed it so that we got to see the ice mounds at dusk and at night when they are all lit up. It got crowded later on but we got there early enough to get some really cool pictures. If we ever go again, which is likely, we agreed wearing warmer socks is key. Both of us brought winter boots but forgot to bring appropriate sock wear...oops!